Join us for an awesome night of Worship and great Southern Gospel Music. Doors open @ 5PM. There is NO CHARGE; a love offering will be received at the close of the concert. Doors open @ 6:15 PM. CLICK HERE to get your tickets now! In honor of Independence Day, East Somerset offices will be closed and all services and activities will be canceled. Reflect. Rejoice. As we thank God for the blessings we enjoy in this great nation, remember to thank Him for the source of true liberty and life, Jesus! 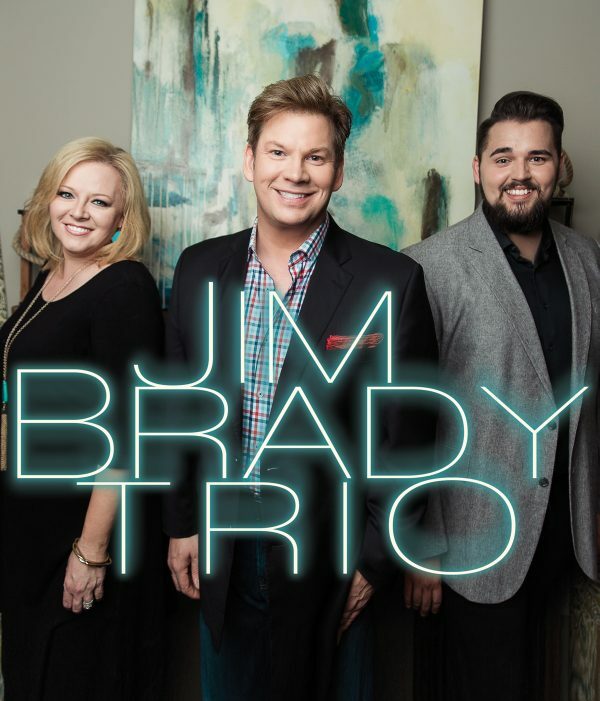 Jim Brady Trio In Concert! The Jim Brady Trio, multiple award-winning Southern Gospel Trio, will be in concert Sunday evening April 29 here at East Somerset. The doors will open at 5 PM. There will be no charge; a love offering will be received at the end of the concert. Join us for a great night of worship! Only King Forever Tour With 7th Time Down! Doors open at 6 PM. Concert begins at 7 PM. For more information or to purchase tickets call 800-965-9324, 0r click here. Zach Williams Chain Breaker Spring Revival Tour! Only a few tickets are remaining for the Chain Breaker Spring Revival Tour featuring Zach Williams. Don't wait, get yours now! Jesus is alive and we have big celebration planned! Note: There will be no evening services or events Easter Sunday. Christmas is Real - Night of Worship & Celebration! "Christmas isn’t just a warm, nostalgic tale. It’s the Word-became-flesh, God-coming-to-rescue-us story. To the non-believer and the skeptic, we say this is a story that really happened on an incredible night long ago. To the searching and the desperate, we say that this ancient story can make a difference in every life today. To those who believe but may have become numb to the miracle, we encourage them with this: Christmas is real. There is real joy, hope, peace, and love that are available to all of us right here and right now." We are so excited to announce "Christmas is Real - a special Night of Worship and Christmas celebration featuring our East Somerset Worship Arts team and EastKids Choir. This worship celebration created by the Dove Award-winning team of David Moffitt, Sue C. Smith, and Travis Cottrell blends a beautiful combination of Christmas favorites, praise and worship choruses and new songs that will have you singing along in praise to our rescuing King Jesus! Join us, family and friends, as we celebrate Jesus' birth Sunday night December 17th at 6pm. Jesus Means Christmas to Me! presented by our EastKids music ministry! Sunday Morning Dec 10th at 10:30am! 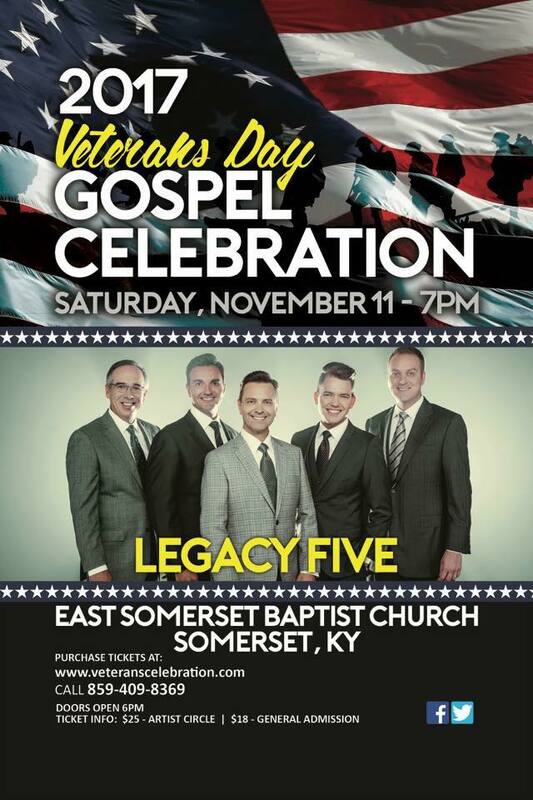 Legacy 5 Veterans Day Concert! Child Dedication Service This Sunday! SIS hosts a special Ladies' Brunch with ALLISON SPEER! Join us Sunday mornings in worship as we study "The Path..."
Join Us For New Year's Day Worship! Celebrate the birth of Jesus in this special intimate worship gathering designed for all ages. Service will start at 11am. No Sunday School or evening services are scheduled today. Join Mark Bishop and other Southern Gospel Artists for a night a great music, fellowship and worship at the annual Galilean Children's Home Fundraiser. It will be a great night for a great cause. Congratulations to Pulaski County High School Football Team for making the State Championship finals. Many will be attending the game in Bowling Green. Those who can't attend in person but want to watch the game can do so with us on the ESBC big screen in the youth chapel. A very merry Christmas celebration with 7eventh Time Down, Adam Agee of Audio Adrenaline, and People of the Earth. Sunday night, December 4th. Doors open at 6:00pm. Concert starts at 6:30pm. VIP tickets include early access to special seating, a meet & greet with the artists, and some other perks. Join us this Sunday night, September 18, @ 6 PM for an incredible night of music and worship with the Booth Brothers! Doors will open at 5 PM. There is no charge; an offering will be received at the end of the concert. VBS like you've never experienced before! PreK - 5th grade! Sometimes our prayers can be dangerous. But those prayers can also be the most liberating! Join us for our series in Bold Prayers and Big Faith for the month of April. Join us for an intimate celebration of his amazing love and power that has set us free. Easter at East Somerset is a unique interactive worship experience for the whole family. The easter egg hunt to end all easter egg hunts! Bring the whole family and enjoy fun and faith filled celebration and community! Wednesday night March 23rd. 6:00pm. Everything changed at the cross. During the month of March, join us as we explore what this means to us and our world.